Celtic Couriers driver Kelvin Rees has one of the biggest smiles around in the Celtic Couriers depot at Burry Port. For he's the driver of the shiny new Mercedes Sprinter which has just been added to the Celtic Couriers fleet. Kelvin said: "I really enjoy my job driving around the SA postal code area and driving the 'Merc' makes it extra special." Celtic Couriers general manager Gareth Jenkins said he was delighted at the addition of the Mercedes sprinter to the company's fleet. 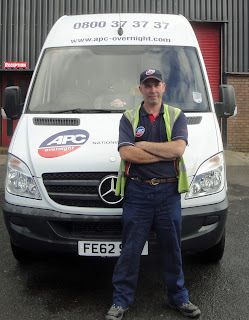 "Reliability is all important to us here at Celtic Couriers. Adding new vehicles to the fleet is very important. Meanwhile, we also take great care to ensure that all our current delivery and collection vehicles are up to scratch. "It's all about being about to deliver the goods here at Celtic Couriers and making sure that our fleet is as up-to-date and as well-maintained as possible is very important to us." Pictures below, Kelvin Rees with the new Mercedes Sprinter van. Radio Pembrokeshire's charity fun sports quiz is being held this Thursday at the Begelly Arms, Kilgetty, Pembrokeshire. Teams of four, only £5 per team member, doors open at 7pm. All money raised on the night will go directly to Macmillan Cancer Care. The quizmaster will be 'Mr Pembrokeshire Sport' Bill Carne. A 'Gimme Shelter' plea has been answered by Celtic Couriers. The courier and delivery firm depot is just around the corner from the railway level crossing in Burry Port. The crossing has been home to a shelter for a number of years. 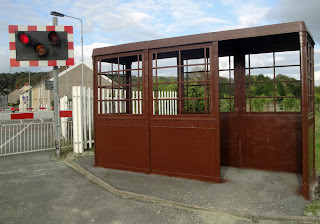 The shelter doubles as a bus shelter and a place to seek refuge from the elements when the crossing barriers come down to halt movement over the level crossing. In recent years, the shelter has suffered at the hands of vandals. The Burry Port Crossing Shelter Project was set up by the local community to breathe new life into the shelter. Celtic Couriers came up trumps with a donation to help refurbish and renovate the shelter. Below, the shelter as it is now, and a 'Thank-you' note from the Burry Port Crossing Shelter Project. Delivery firm Celtic Couriers Ltd is supporting Burry Port Rugby Football Club. 'The Blacks' of Burry Port have just received a donation of 'subs suits' for first team players. Senior coach Matthew Williams said: "The suits are great and help keep the guys on the replacements bench warmed-up and ready for action on the field of play. They are a big boost and they have been welcomed with open arms by the players now that the cold of winter is approaching." Celtic Couriers business development manager Clayton Moore was on hand to make the presentation of the kit to Burry Port RFC before the match against Laugharne in Division 4 West in the Welsh SWALEC leagues. Mr Moore said: "We are always delighted to lend our support to a number of different local organisations. "We have an excellent relationship as sponsors to Burry Port RFC and when they mentioned they needed new kit we were glad to help out. Housing Minister Huw Lewis has officially opened the new headquarters of the Gwendraeth Tenant Network at Pontyates. Mr Lewis was welcomed to the HQ by a choir from the nearby Ysgol Gwynfryn, before unveiling a plaque and declaring the facility open. The Gwendraeth Tenant Network has been running for many years, but - in conjunction with Carmarthenshire County Council’s Housing Services Division – tenants saw an opportunity to develop a redundant day club building into a resource centre. The council agreed to lease the building to the tenants and they now operate the centre as a community hub for all Carmarthenshire Council housing tenants. The Minister said: “It gives me great pleasure to open the Gwendraeth Tenant Network’s new headquarters. Housing is about so much more than putting a roof over people’s heads, it’s about creating vibrant communities and offering people new opportunities I am delighted that just such a community exists here in Pontyates. The Institute of Welsh Affairs (IWA) is organising a conference called Improving Welsh Procurement. It will be run in association with Constructing Excellence in Wales. Public procurement is an important driver for economic development and employment. At some £4.3 billion the Welsh public sector’s annual procurement budget is one of the main economic policy levers in Welsh hands. But how effectively are we using it? Are we achieving the right balance between risk management and creativity in public procurement, especially with contracts below the EU thresholds? Are we encouraging Welsh SMEs to learn from the tenders they make by providing adequate feedback? How are we addressing the skills gap that exists amongst Welsh procurement professionals? How can we push the profile of procurement management higher up the policy ladder? A pair of West Wales businesswomen have set up an innovative lunch-time networking forum for businesses called Beyond20. Sarah Wynne, of Chartered Accountants and Business Consultants Clay Shaw Butler, and Jo Watson, of Antur Insurance, have established a new Carmarthen-based forum for ladies to meet for business networking. The first two lunchtime meetings have been held at the Angel Vaults restaurant in Carmarthen and have been a great success, with more than 20 ladies attending the October event. The next meeting is planned for Wednesday, November 14, at the Angel Vaults, 12.30pm. “There are quite a few business networking meetings and organisations around, but nothing quite like this,” said Sarah Wynne, Relationship Accountant with Clay Shaw Butler. Clay Shaw Butler accountant Amanda Russell is running the Cardiff half marathon on Sunday. She is joining a team of five other runners from West Wales raising money for a small country in west Africa called Burkina Faso. Amanda said: "The United Nations rates Burkina Faso as the world's third poorest country and so they need as much help and money as we can give to allow them a chance to become self sustainable. The money being raised is specifically being put towards flood prevention so please follow the link below to donate. Thanks! "The situation in Burkina Faso is urgent with thousands facing famine NOW. Please give what you can. Forty five per cent of Carmarthenshire County Council’s housing stock has achieved the Carmarthenshire Homes Standard, years before the end of the authority’s ambitious £203million improvement programme. By 2015, all of the council’s homes will achieve the standard, with many of the work programmes – including loft and cavity insulation - already completed ahead of schedule. The Carmarthenshire Homes Standard was launched in 2005 as a 10-year programme to improve the council’s 9,000 homes, as well as improving tenants’ communities and general health and wellbeing. Last year alone, £26million was invested with 959 new kitchens and 853 new bathrooms installed; 871 efficient heating systems; 575 hard wired smoke detectors and 878 carbon monoxide detectors. A man has been fined £200 by magistrates for dropping litter in Carmarthen. Carl John Wilkinson, aged 34, of Min Y Coed, Tonmawr, Port Talbot, was also ordered to pay £315.57 prosecution costs and a £15 victim surcharge. Wilkinson failed to attend Carmarthen Magistrates Court for the offence contrary under the Environmental Protection Act 1990 and the case was proven in his absence. The court heard that council environmental enforcement officers were on duty in the Myrtle Hill area of Carmarthen when they saw a parked vehicle with a takeaway bag and cigarette packet underneath. The officers approached the vehicle and identified themselves to the driver who conceded he deposited the items of litter on the ground. He was issued with a fixed penalty notice for £75 but failed to pay it within the specified time. Plans to deliver a 10-pin bowling alley and other community facilities in Carmarthen are gathering pace. On target to open next summer, the Towy Community Church Xcel project at Johnstown will deliver a 12-lane 10-pin bowling alley and family play area. Included in the first phase of the scheme in the rapidly transforming former St Ivel’s factory is a food bank and furniture recycling project. The community church has attracted significant funding through fundraising, securing grants and a commercial mortgage and loan from Carmarthenshire County Council to cover the first phase of this major regeneration scheme. Checking on the progress of the project, county leader Cllr Kevin Madge said: “With all the bleak news of threats on leisure centres and leisure services generally in these financially constrained times, it is wonderful to see an exciting project like this being delivered that is going to be so popular with families and young people. Don’t catch flu this winter – get jabbed! People in Ceredigion are being urged to get jabbed to ensure they are best protected against catching flu this winter. Hywel Dda Health Board is offering a free flu jab to those people who are at the greatest risk of flu including those aged 65 or over, pregnant women and those with health conditions such as asthma, chest or heart problems, lowered immunity and diabetes. For the first time, the flu vaccine will be also available from 137 pharmacies in Wales, with selected pharmacists given special training to administer the injections. Flu is a contagious infection that can kill and anyone that falls into an at-risk group should be vaccinated to ensure they protect themselves and their families. Students at Stagecoach Carmarthen are in for a treat this term when they get a taste of stage combat and stunt fighting. Mark Ruddick will be arriving at the theatre arts group to give senior students an insight into his work as a professional stunt performer. Mark has worked on number of feature films and has also help ‘fight arranging’ for clients such as The Glyndebourne Opera, The Broadway Theatre London and Realm Pictures. 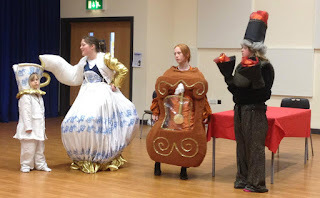 “It’s a big chance to see an expert at work,” said Stagecoach Carmarthen theatre arts group principal Liane Davies. Places on the stage combat tutorial will be limited. Anyone who wants to join Stagecoach Carmarthen, should get in touch with Liane on 0845 604 1422 or email carmarthen@stagecoach.co.uk. Places on the tutorial are limited. A new £8.8million state-of-the-art Clinical Decisions Unit (CDU) has opened its doors at Glangwili Hospital in Carmarthen. The new unit brings together medical and surgical assessment, as well as Community Resource Teams, pharmacy and hospital multidisciplinary teams, 24 hours a day. It provides assessment and treatment for patients, improving admissions into the hospital and supporting other frontline services such as the Emergency Department and GPs. Patients are referred to CDU by a doctor - either their GP or a doctor in the A&E department -who has made an assessment of their condition and who thinks that the CDU is the best place to investigate the problem further. Patients can be referred to the CDU with a wide range of medical or surgical conditions. 'Meet the health board' . . . virtually! A ‘virtual’ Meet the Health Board event next week will allow people who can’t attend the locality events to learn more about the health board’s consultation and ask questions. People are invited to visit Hywel Dda Health Board’s Facebook site between 3pm and 4pm on Tuesday October 16th. They will be signposted to online information about Your Health Your Future - Consulting Our Communities and there will be an opportunity to pose questions, which will be answered by senior executives or clinicians. Pupils at Carmarthen’s leading theatre arts school have been celebrating their exam successes. The end-of-term exams at Stagecoach Carmarthen saw an amazing 98 per cent pass rate. All the students aged six and above sat exams, with each child being marked individually on dance, singing and drama. “It’s a magnificent achievement by the Stagecoach pupils and parents and teachers are all very proud of their success,” said Stagecoach Carmarthen principal Liane Davies. “It’s been a busy year for Stagecoach pupils as we had a magnificent success with four performances of the musical Annie at The Lyric Theatre in Carmarthen in the summer. “The performances saw three different ‘Annies’ take the stage – and one dog! More than 1500 people saw the performances. A new traffic flow system is now in place at Withybush Hospital in Haverfordwest to make way for the £7.5million state-of-the-art Renal Dialysis unit. Work on this new facility has recently commenced and will be open to patients by February 2014. As part of the preparation for the construction of the renal development, temporary changes to patient and staff car parking are required to be undertaken. The main entry and parking for patients and visitors to the hospital site is via the Fishguard Road using the front car parks. Patients and visitors can no longer access the site from the roundabout entrance. Exit from the front car parks can be either via the main site entry point (as is currently the case) or alternatively via the link road between the two car parks, which has changed to a one way flow. Attendants will be on hand to help manage these changes in the initial implementation stages. Continental style street Christmas fairs are coming to Carmarthen’s streets this year. That is if enough craftsmen and women can be found to fill stalls there. There are more than 60 craft businesses set up about the county but there are many more talented individuals creating stunning items in their homes. Anyone who has a talent for producing arts and crafts for the Christmas market has an opportunity to market them through Carmarthen’s Christmas fairs. Carmarthenshire County Council’s Arts Department in conjunction with Merlin’s Walk and St Catherine’s Walk shopping centres, are inviting allcomers with that Christmas sparkle in their talents to take part in a Christmas Fair at on December 14 and 15. 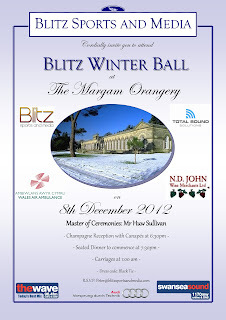 The Blitz Charity Winter Ball is being held at the Orangery in Margam Park on December 8. The event will be supporting the charity Welsh Air Ambulance. Owing to its widely scattered population and diverse landscape, many in Wales live in isolated locations far from an accident and emergency service. Also, the ever increasing problem of traffic congestion and collisions in more urban areas causes delayed response times for land ambulances. For these reasons, there is a recognised need for three helicopters on active duty 365 days a year. The charity needs to raise more than £6 million per year to operate the service. The charity raises all the funds required for the day to day running of missions, with each mission on average costing £1500. Carmarthen’s leading theatre arts school is continuing with its successful Welsh language classes. Stagecoach Theatre Arts Carmarthen launched new bilingual classes for ‘early years’ pupils at the school on St David’s Day. “We wondered what the reaction would be,” said Stagecoach Carmarthen principal Liane Davies. “But we have been delighted with the response. The classes are a big hit and we are continuing them this term (the new term started recently). “We have plenty of resources as I am a fluent Welsh speaker, along with two of my early stages staff. 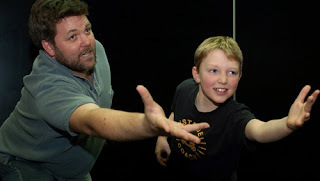 “We were keen to test the opinion of our students and their mums and dads. Everyone seems very keen on the idea, so we are continuing to have a bilingual class for one of the early years classes for four to six-year-olds. “I am a passionate supporter of the Welsh language and think that everyone deserves the best possible start in life by being bilingual. A Carmarthenshire Post Office is going from strength to strength after a mini army of volunteers joined forces to save it from closure. In 2009, Dryslwyn store was under threat of being lost to its community until residents rallied around to keep it going. Four years on, the not-for-profit store - which also serves as an internet café, tearoom, grocery store and off licence - is thriving. The venture, supported Carmarthenshire County Council, is part of the Carmarthenshire Community Challenge. The scheme urges communities to develop their own local projects to promote sustainability and help reduce their impact on the planet. The idea is that everyone can help make a difference to the area they live in, and that simple lifestyle changes can make a big impact. RDP Sir Gâr’s Rural Community Inclusion (RCI) project is hosting an open evening to help try and improve broadband for those living in rural areas. They will be in Bryn Chapel Hall in Llangynin on Thursday November 1 with suppliers Bluewave, TFL, ResQ and Telemat to let you know the options available to you for getting a better broadband connection. RCI offers a package of support that is designed to increase access to basic services and facilities in rural communities - including broadband service. The project is funded through the Rural Development Plan for Wales 2007-2013 which is funded by the Welsh Government and the European Agricultural Fund for Rural Development. Registered charities, voluntary organisations, town or community councils, social enterprises, not for profit organisations and individuals all stand to benefit from RCI support and expert Project Development Officers will be on hand during the evening to discuss your project with you. Sorry for the lack of posts. Man flu beaten. Now back in business! Wonderful weekend. MC at Cor Meibion Llanelli concert in Surrey to raise money for the Royal Marsden Hospital Cancer Charity.